Permanent Representative of St. Kitts and Nevis to the United Nations in New York, U.S.A.
His Excellency Sam Terrance Condor graduated with a Diploma in Development Studies from Ruskin College, Oxford and a BA (Hons) in Economics from the University of Sussex in Brighton. Appointed as Ambassador Extraordinary and Plenipotentiary and Permanent Representative of St. Kitts and Nevis to the United Nations in May 2015, he presented his credentials to Secretary General Ban Ki-moon on October 27, 2015 and since that time, served as Chair of the Caucus of Ambassadors of the Caribbean Community (CARICOM) in New York as well as of the Group of Latin American and Caribbean States (GRULAC). First elected as a Member of Parliament in 1989, he continued in this capacity in ensuing years following his success at the polls in 1993, 1995, 2000, 2004 and 2010. 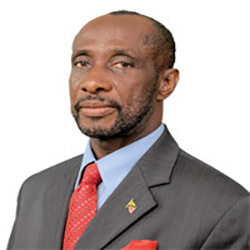 In addition to serving as Deputy Prime Minister of St.Kitts and Nevis between 1995 and 2013, he was also the Leader of Government Business in the National Assembly. During his eighteen year stint in Government, he held various portfolios: Minister for Foreign Affairs, Homeland Security, Labour and Social Security (2011 to 2013), Minister for Foreign Affairs, National Security, Labour, Social Security and Immigration (2010 to 2011); Minister for Education, Youth, Social Development, Community and Gender Affairs (2004 to 2010); Minister for Labour, Social Security, CARICOM Affairs, Telecommunications and Technology (2001 to 2004); Minister for Foreign Affairs, International Trade, CARICOM Affairs, Community and Social Development and Gender Affairs (2000 to 2001); and Minister for CARICOM Affairs, Youth, Sports and Community Affairs (1995 t0 2000).